Thanks for sharing! That's a really great photo of Lone Star. Now I'm regretting not going to the National this year! Out of curiosity, is it a RPPC? If so, is it trimmed with some glue and black paper on the back as if it had been torn from a scrapbook? I have several other Lone Star items that I've slowly pieced together over the years that all have these similar traits. I'm thinking they all once were part of one person's collection that got broken up. No, its a photo with a date stamp on the back. No back damage on this one. 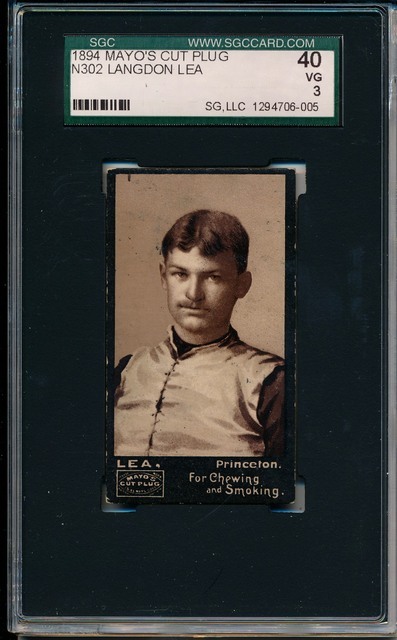 Picked up this 1893 Cabinet of National Champs Princeton at the National. There are eight players in this picture that are in the Mayo football set! can you pick them out? Is Holly second from the left? Ward 3rd from left sitting? Taylor or Burt third from right? 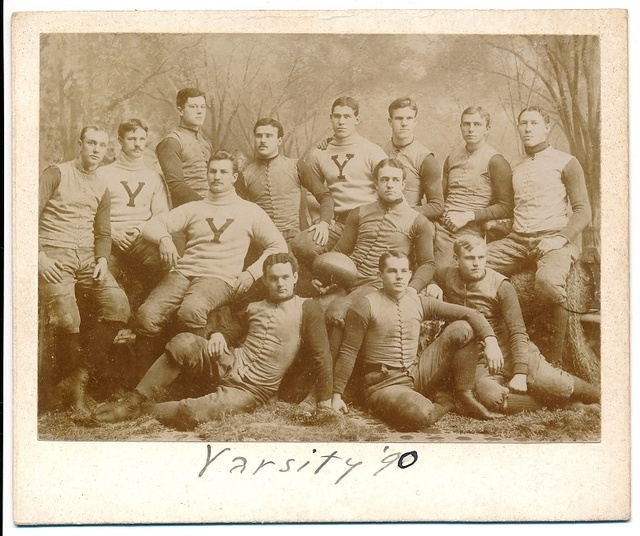 It is generally believed that the Mayo set was created from player images taken from 1893 team photos. Photo images were touched up to remove surrounding players and uniforms were redrawn/sketched as needed. You can see the similarity when comparing the poses in this team photo with the Mayo cards themselves. Last edited by jefferyepayne; 08-16-2015 at 09:25 AM. Incidentally, Jeff, Huggins & Scott has another Grange football box in their November auction, item #89244. The graphics are different from yours. I actually like the one you purchased more. No football with this one either. Nice, guys! Can you imagine if they had done an entire Sports King set of football players? I love the Grange and even though it isn't his earliest card, it's still a period card. The vertical stripes on the uniform is a classic look and I think it's the Bears and not Illinois: http://www.gridiron-uniforms.com/tea..._ChiBears.html. And I guess because it's 1933, he even looks kind of... tired. It is definitely his Chicago Bears uniform. The Illinois friction strips come to a peak in the middle and there is no horizontal strip. Look at the shotwell wrapper earlier in this thread for an example. Thanks Jeff - glad its an NFL uni - my only quibble then is with the back of the card - he essentially caught the game winning pass in the "Super Bowl" the season before and it didn't even warrant a mention! 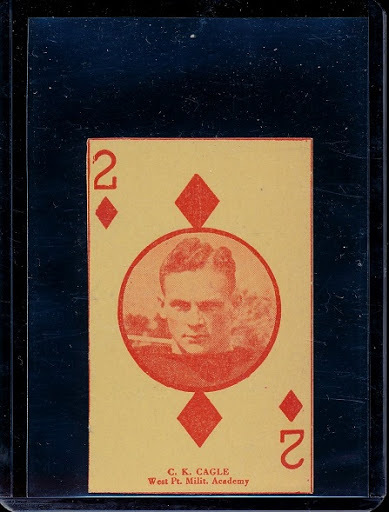 I always had a dream that someday, someone would find a third series of SK and among the 24 cards would be a Nagurski & Nevers. Time to wake up. Not gonna happen. 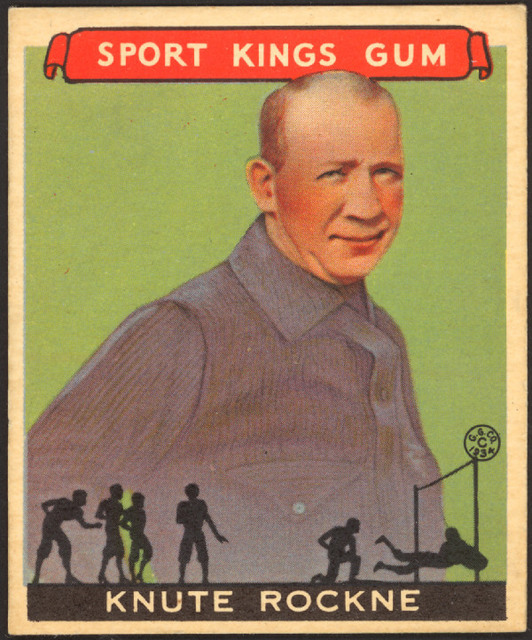 I agree with Mike also, the Sport Kings Rockne is much more aesthetically appealing than the National Chicle. My wife says "He looks like a baby doll" on the National Chicle and actually calls the card the "Baby Head card"! I just want to sat thank you to everyone posting on here. My account was just activated this morning, but I read through this in detail last night. I appreciate the knowledge and book suggestions! I love college football and don't care at all for the NFL, but I've decided to get back into vintage football because of my love and respect for the history. I've loved the books I've read on early football and will be reading more soon. Again, just wanted to thank everyone. I was advised to come to net54 if I wanted to get into vintage and I'm not disappointed in what I've found. Can't wait to read more on this, and other, threads! The first thing that came to mind when I saw WVU and your interest in history was Greasy Neale. 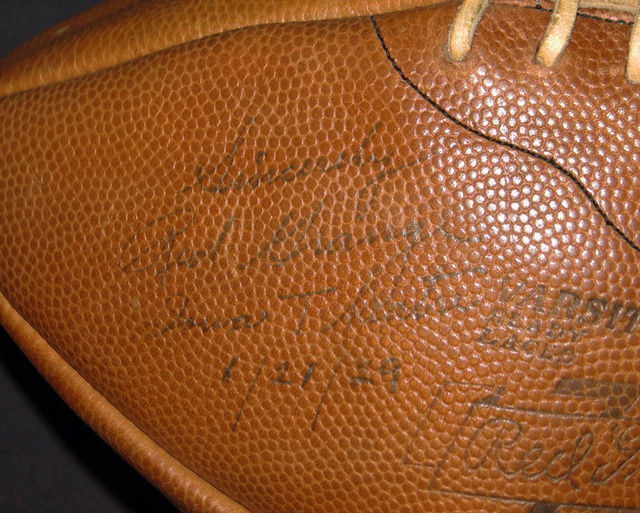 He's from West Virginia, coached briefly at WVU, but what's amazing to me is following his thread through NFL history. 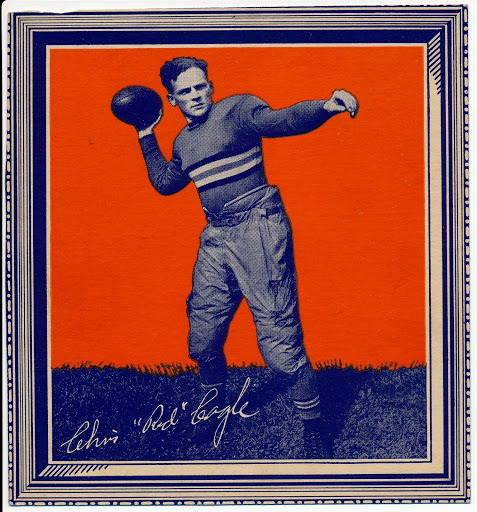 He played with Jim Thorpe, coached the Ironton Tanks, won 2 NFL titles with some great Eagles teams, etc. There was another name mentioned that coached at WVU for just one season, but the name is escaping me at 6:15 in the morning. This period Neale is affordable but doesn't show him in his football uniform. Last edited by jefferyepayne; 09-04-2015 at 06:40 AM. 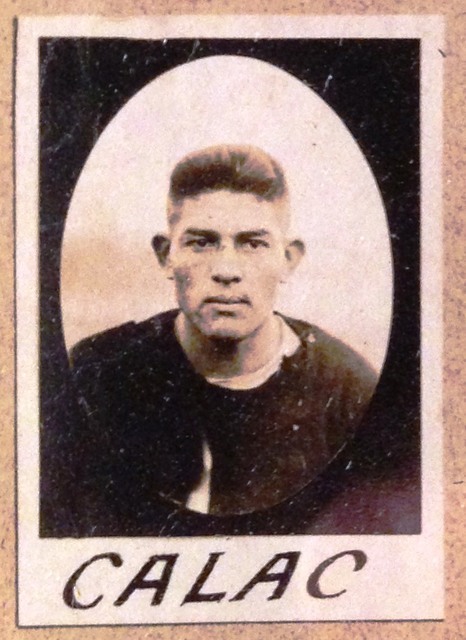 In the early 1920s, Jim Thorpe was hired by Walter Lingo to coach a team called the Oorang Indians. The Indians were a traveling NFL team that was a showcase for Lingo's Oorang dog kennels. The team was in the NFL in 1922 and 1923 but only went 4-16 ... mainly because Lingo cared more about showcasing his Airedale dogs and Indian players than winning games. All of the Indians players were at least partially of Indian descent. Thorpe brought in some of his former mates from Carlisle and Canton (including Pete Calac) but also younger Indian players. Last edited by jefferyepayne; 09-12-2015 at 07:14 PM. Very nice, Mike! I think I tried to snag that but you outbid me. Haven't posted in this thread in a while but have picked up some nice pre-war stuff in the past month. 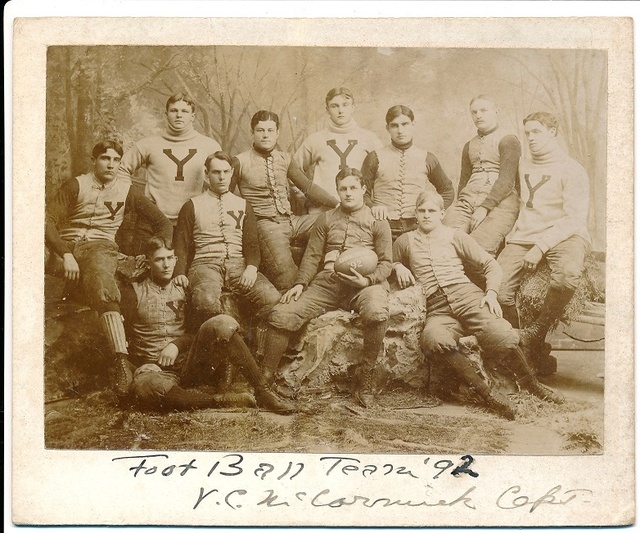 Cabinet cards of the 1890 and 1892 Yale football teams. The 1890 cabinet has Pudge Heffelfinger in it while the 1892 cabinet has Frank Hinkey. 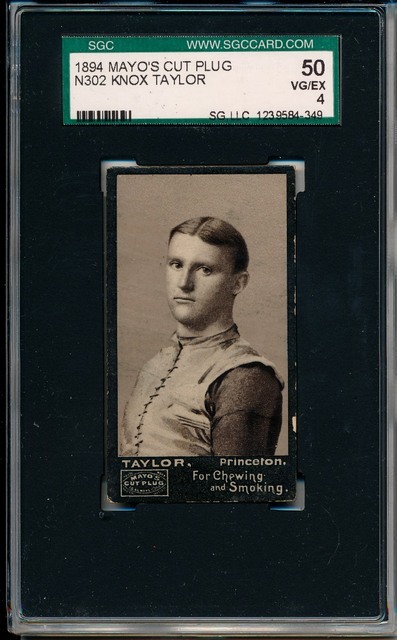 Cabinet cards like this are sooo cool as they are basically the football cards of the 1800s. 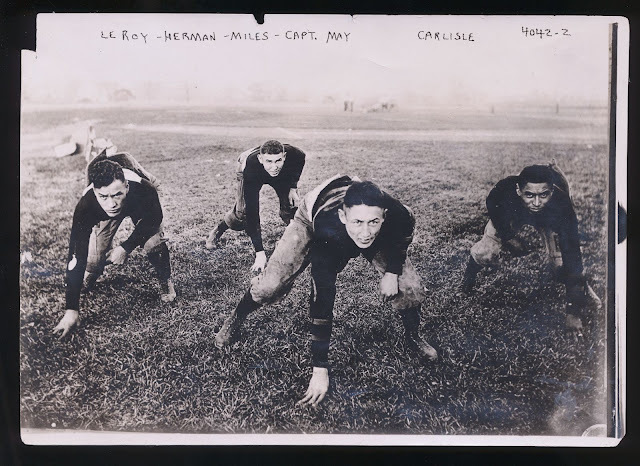 I showed this image of Thorpe and his backfield mates at Carlisle earlier in this thread but that photo was a re-strike (a photo produced later in time from an original negative) and this is an original. Another original photo. 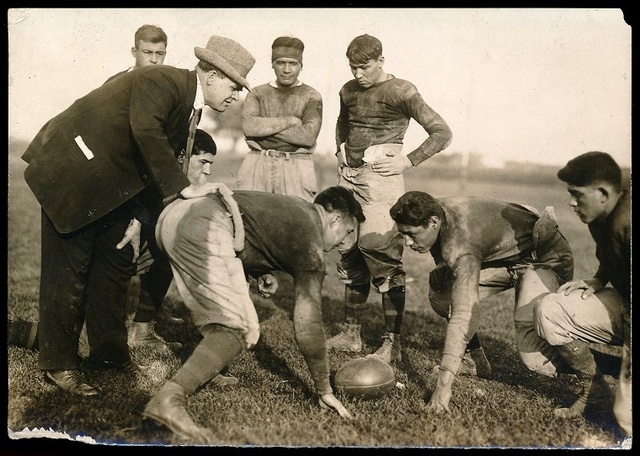 This one of Pop Warner coaching his Carlisle boys. The Mayo set is actually not the only football tobacco set produced. 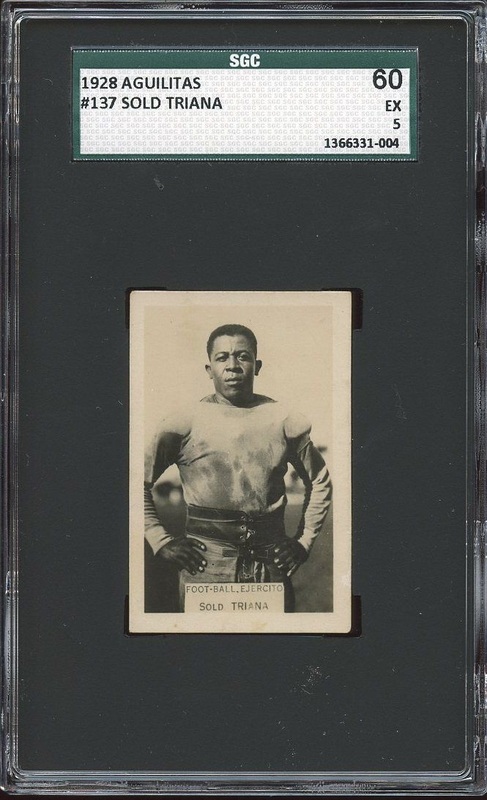 Here are a few cards from the scarce 1928 Aguilitas set that depicts Cuban football players. Backs of the cards are in spanish. I'm looking for more info on the origins of this set so if anyone is familiar with it (or the Aguilitas company), please PM me. 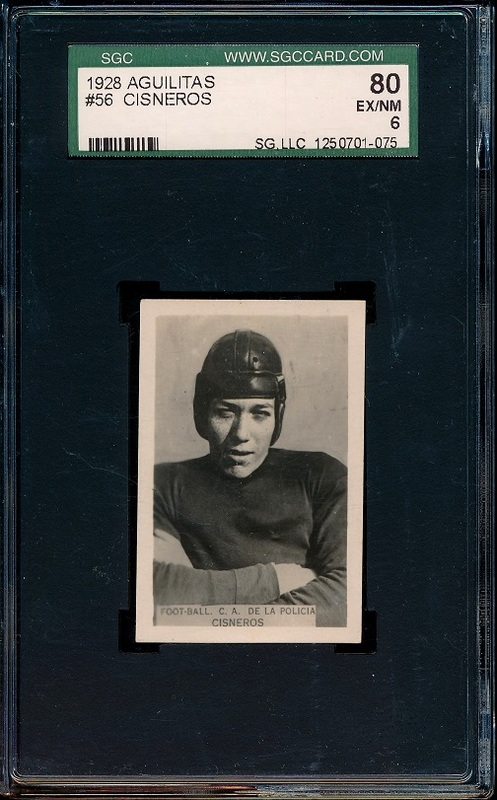 Last but definitely not least, I finally snagged an example of a Shotwell Red Grange candy box. Last edited by jefferyepayne; 10-12-2015 at 08:35 AM. 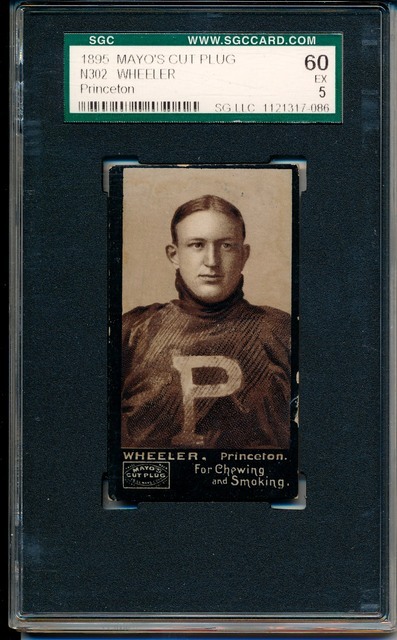 Picked up this box for a Red Grange football a while back. I may have posted it on here somewhere. Recently I was able to pick up a football that was contained in this box and its even autographed and dated by Grange! To hold something that Grange had in his hands is just simply awesome! Just picked this up last week from ebay. 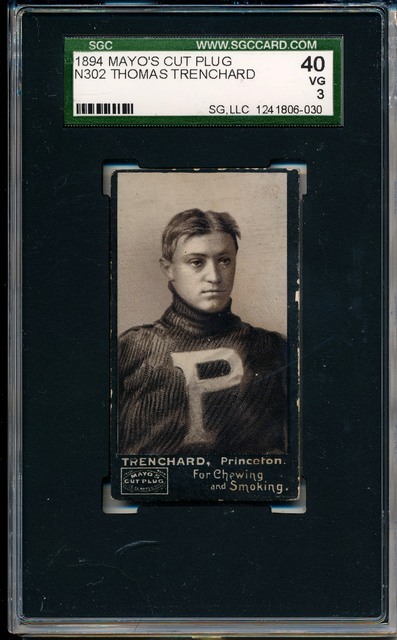 It's a large cabinet card advertising the Nov 28, Thanksgiving Day showdown between Dartmouth and Brown (the Big Green won 22-0). This seems to have been a popular publicity campaign for the school. I've seen another copy of this cabinet on ebay where the seller provided a nice write up of the piece. I've also seen postcards from other years with the same motif of the coach, trainer and captain. The man on the left is an athletic trainer named John Bowler, the man in the middle is Captain John O'Connor and on the far right is the coach, Walter McCornack. I think the piece has a cool aesthetic and the Rah-Rah quotes below the photograph just make me chuckle a bit. Nothing new for me but I did recently purchase a display cabinet that came from an old drugstore. Here's my first attempt at a pre-war football display. Nice display and love the variety of Grange and Thorpe - can't go wrong there! Peter, didn't see your post til now. I grew up near Brown and now live near Dartmouth. I know some of the Big Green's coaching staff. Cool to see a piece of history like that. Nothing new for me but I did recently purchase a display cabinet that came from an old drugstore. Here's my first attempt at a pre-war football display. Wow, love the variety of the Thorpe cards. The Exhibit cards and the Olympics Heroes postcard have been on my want list for a while now, but none of them pop up too often. Love the display. I always liked the Grange Yeast Foam ad that also came from dug stores (where he is punting the football)! Two questions. 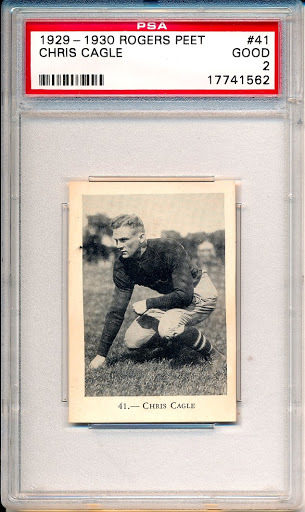 What is the large die-cut piece with the guy passing the ball (middle of the display cabinet-very cool) & where is your Red Grange model Football (it would be a great companion piece with the box)? Nice Thorpe Zeenut!! Keep them out of the sun...I have seen some nice goodies get sun bleached before. Very nice! Die-cut piece is a Catalina Sweater advertising piece of Jay Berwanger (first Heisman winner). There are other college players who have similar Catalina advertisement pieces like this. 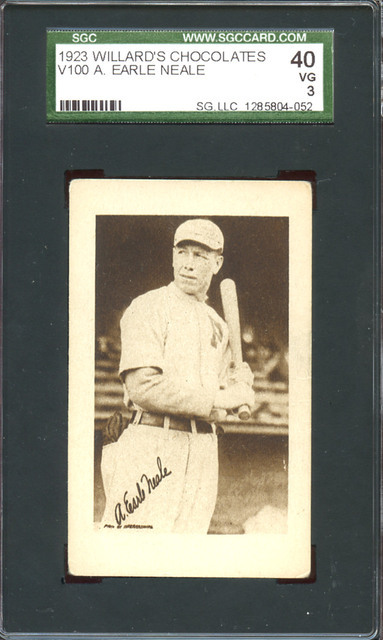 MSB Sportscards has a few of them on their web site if anyone is interested in getting one. They are really hard to find. I haven't put the football in this display yet. I'm actually planning to redo it as a Grange only display and will include it then. 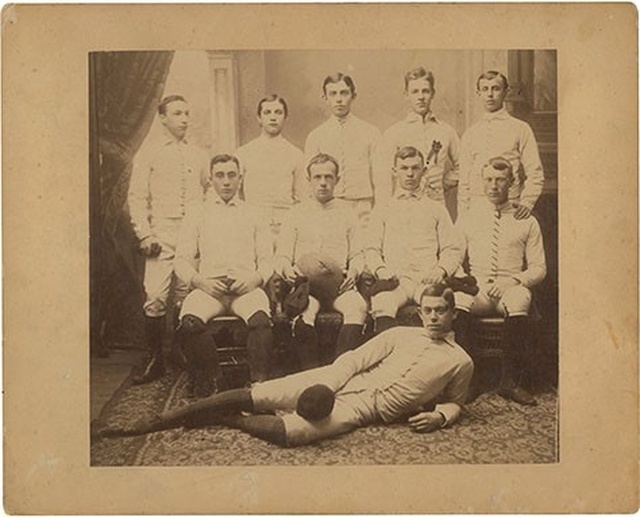 Orient Football Club is believed to be the first football team formed in Washington DC. This cabinet came with a newspaper article from 1889 that discusses their formation in 1883! For the first couple of years, they had no opponents to play as they couldn't find another team so they just practiced in Lincoln Park in DC. I was in downtown DC about a year ago and had a couple of hours to kill between meetings so I went down to Lincoln Park where the Orient Foot Ball Club practiced in the 1880s. Here are some pictures. A lot more concrete in this park than I bet there was in the 1880s! Some beautiful old townhouses surround it now. Picked up this 1916 picture of the Carlisle backfield a few weeks ago. 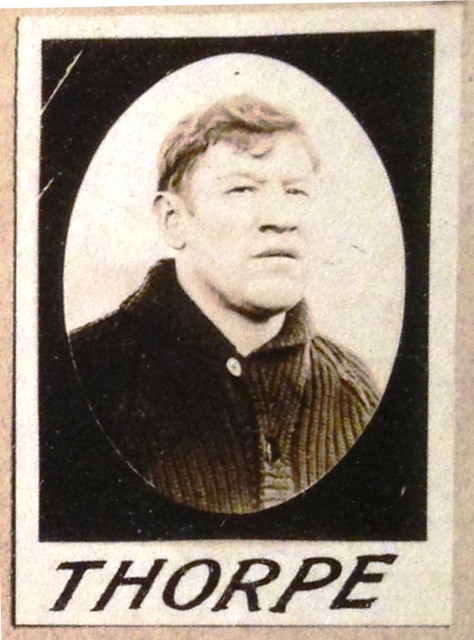 Tom Miles was Jim Thorpe's cousin. Picked up this 1910(ish) photo of Eddie Mahan. 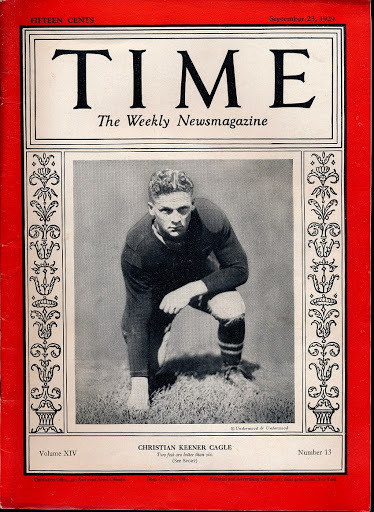 "Eddie Mahan of Harvard was the greatest football player I have ever seen. He had everything, he could run, pass and kick. He was big, weighed 190 pounds, was smart enough to play quarterback and also good enough to play in the line. To me that's proof enough that Mahan was the tops. He was a specialist in all lines." 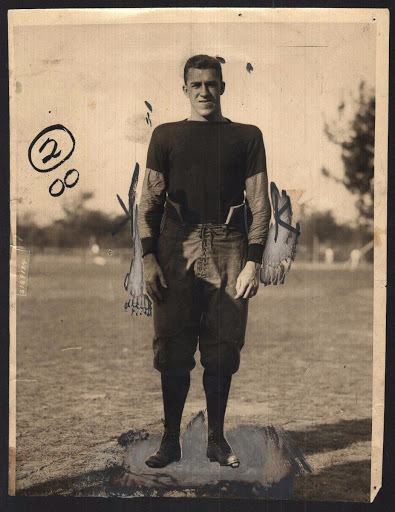 "If the future football generals develop a better all-around man than Eddie Mahan, captain of the great Harvard team of 1915, whose playing brought not only victory to Harvard but was accompanied by great admiration throughout the football world, they may well congratulate themselves." "In the writer's opinion, Grange and Mahan are the greatest backs he ever saw, from the standpoint of advancing the ball. Grange seems to run with more power than Mahan and a trifle more laboriously, because he is not quite so light-footed. It may be doubted whether he is as fast, but that is mere guesswork. Football, carrying the ball, seemed play to Mahan. Grange does not do his work in quite that effortless manner." In 1927, George Trevor of the New York Sun selected an all-time backfield made up of Mahan, Walter Eckersall, Jim Thorpe, and Willie Heston of Michigan. 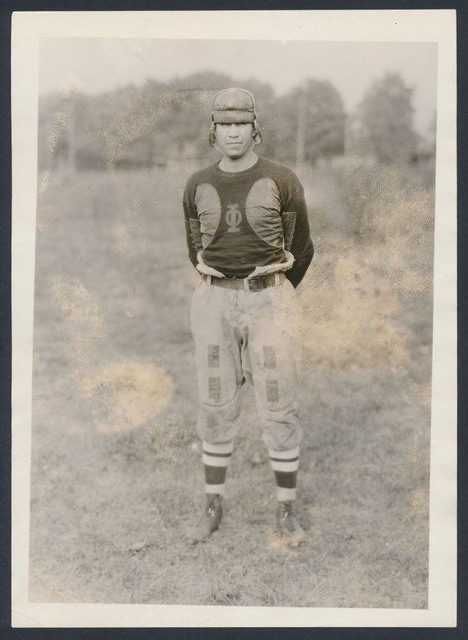 Western football expert Walter Eckersall added, "Mahan is awarded the honor of being Harvard's greatest football player, a terror to the opposition offensively and defensively. As a line plunger he ranks with the greatest in history." 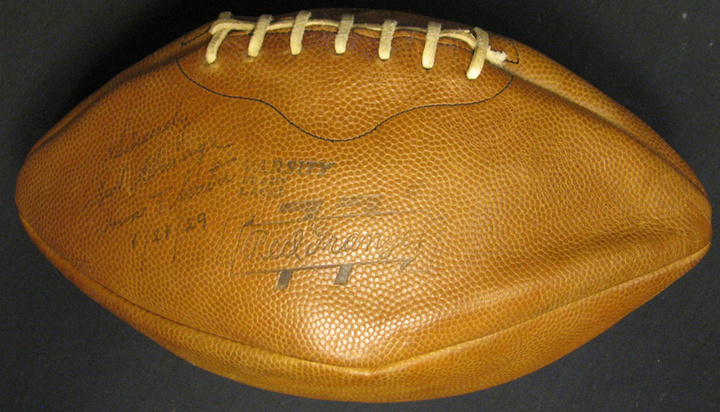 In 1951, Mahan was inducted into the College Football Hall of Fame as part of the first group of inductees. Last edited by jefferyepayne; 12-22-2015 at 06:51 PM. Awesome stuff Jeff - I never heard of Eddie Mahan. I do have a couple more Tex Hamer type guys (later time period ) I'd like to sneak into posts at some point though. Last edited by TanksAndSpartans; 12-23-2015 at 02:58 PM. The second football player on the cover of Time Magazine. Who do you think was the first? Professional football was once a joke. It is now a riddle. Last week in Manhattan met the various Tsars of this sport to debate on future plans, regulations. Their talk was backed by a history and menaced by a mountain. The history is the history of professional football from its beginnings on various sandlots long ago to its sudden rise to eminence behind the weaving hips of Harold ("Red") Grange. Men took money for playing football before there were any "professionals." There were no professionals because there were no amateurs. One does not speak of a professional plumber. One does not point out as exceptional a boilermaker who accepts money for his labors. 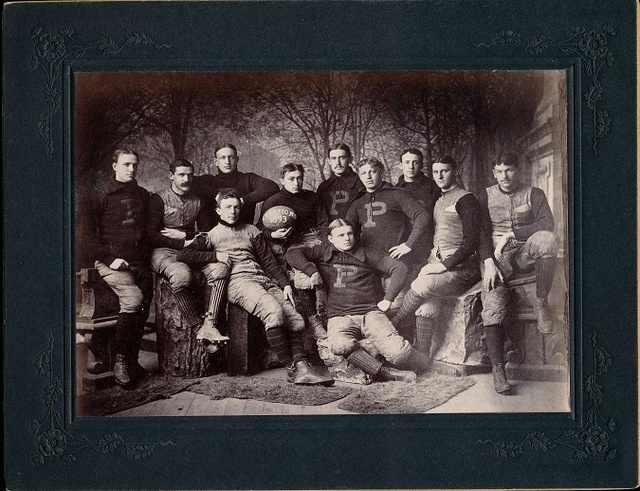 And the first professional football players were plumbers, boilermakers, who received wages simultaneously for their plumbing, their boiler-making, and their playing. Factories had their teams, mill towns and vinegar works were advertised as much by the efficiency of their elevens as the excellence of their wares. Sometimes these teams "bought" college players with big reputations to strengthen their lineups; sometimes they developed players who were afterwards "bought" by colleges. It was common practice for the big universities then, as it is for the smaller ones still, to entice able players to enroll as undergraduates, and spend six or seven years, to be graduated at length with a Bachelor's degree awarded, presumably for prowess in Sacred Studies and Botany. But before the birth of the Twentieth Century the universities began to organize, to make treaties with one another; football, already moderately standardized, became a science as rigid as modern warfare, and paid players became professionals. Now these professionals are combined into organizations analogous to those of baseball. Thus, there is a National League and an American League. The National League is the older, contains 24 Clubs, a number obviously unwieldy. This year is the first of the American League, which is composed of nine clubs only. The League made rules. No college player could play professionally until his class had graduated from college. As for money, visiting teams are to receive some 32%, of gross receipts, the remainder to be apportioned between the home team owners and players with a sort of bonus for high ranking at the end of the season. 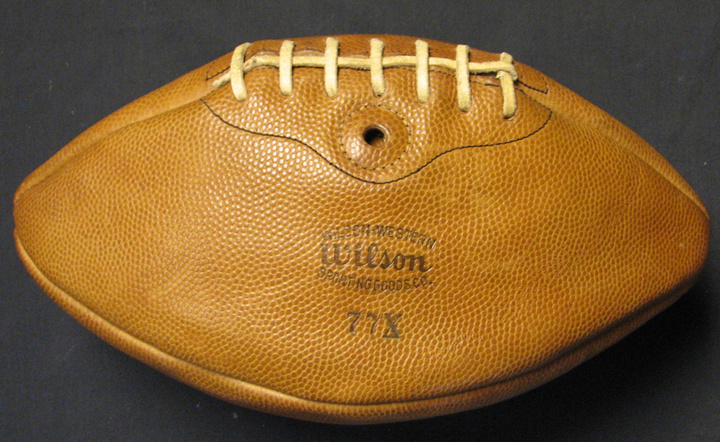 The football League rules are identical with those of the respective baseball Leagues save that the word "football" is substituted for "baseball" throughout. And as its overlord, sits a man whose mountainous bulk overhung last week's conference— William Hanford ("Big Bill") Edwards, the Peter Pan of Princeton. "I have taken this job ... to help preserve high-class football as it is played in colleges . . . a clean, red-blooded sport . . . great character-builder. . . ."
Thus Mr. Edwards, his dewlap trembling with earnestness, announced to newspaper men on his assumption of the Presidency of the Professional Football League., His position obviously, is authoritative. His salary is $25,000 a year, his term of office three years; he is to football what Will H. Hays is to the cinema, Judge Landis to professional baseball. The reporters, in their stories, spoke of him as "spectacular." All his life that word has been applied to William Hanford Edwards. He weighs 300 pounds. He can get into a lower berth but not behind the wheel of an automobile. He always sits on the aisle at the theatre. He can use ready-made handerchiefs. He once saved the life of onetime (1910-13) Mayor William G. Gaynor of New York. 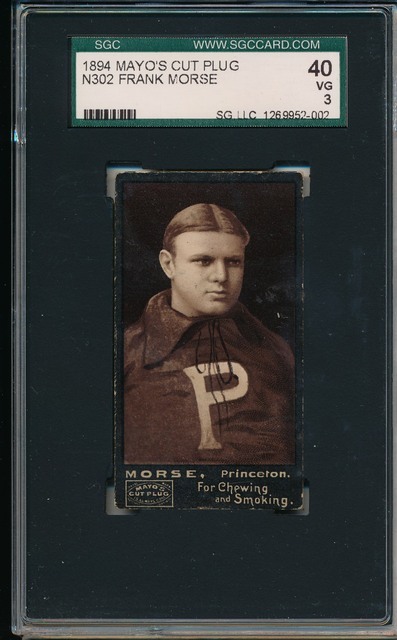 He is said to have been the fastest big man that ever played football at Princeton. When William Edwards was very young a physician, examining him, declared that he was "spectacular." "In what respect, Doctor?" inquired a relative gazing anxiously at the pink muddle on the bed. "For his puniness," answered the practitioner. The doctor spoke sincerely. Mr. Edwards at that time had hollow flanks. The thinness of his arms was hardly compensated for by the unhappy protuberance of his abdomen. A course at the Manlius Military School, however, so far improved him that he weighed 217 pounds before he went away to school at Lawrenceville. He became the idol of his fellows. Second formers stuffed pillows under their coats in order to resemble him. He was bulky then, but hard, and quick afoot. He entered Princeton at 268. 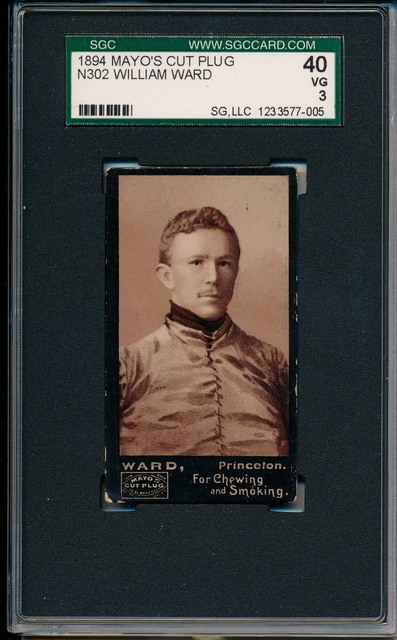 In his junior year (1898) he became the Princeton captain, and his fame boomed like a cheer over all the land. He was at this time 268. When, at 21, he graduated from college, the Carnegie Steel Plant at Pittsburgh offered him a job. Officials of the plant felt that he would be a useful addition to the company football team, one of the paid sand-lot elevens that were then flourishing. Mr. Edwards, sensing that he had not been called on for his knowledge of the steel business, refused. He coached for two years at Princeton and Annapolis, and used a whistle at many famous football games; a friend suggested a political career and Mr. Edwards, acceding, secured a job in the New York City Department of Street Cleaning. "'D'ye see that elephant?... Turn slowly, you can't miss him. . . Well, that's 'Big Bill' Edwards " And "Big Bill" Edwards catching the glance, will chuckle within himself. He is fat now; he couldn't run two hundred yards, but one thing he remains, and is content to remain, something that it is hard to find a name for, except an old one, and that is—well, —spectacular. Great post, Mike! I'm a big Chris Cagle fans as well. Here are a few Cagle items. I noticed you didn't mention his Rogers Peet card in the article. Any reason? P.S. I WANT that Albert Richard! Last edited by jefferyepayne; 01-09-2016 at 07:11 AM. before now I had not seen a scan of that card - nice to know - thanks for posting it! I may amend the article to include it if that's ok with you. Absolutely! Love your article. Didn't know you hadn't seen it. The last few posts on this thread have been so great and educational! Thanks for the knowledge drop guys! Pretty sure both Rockne and Grange appeared before Cagle. Here are some meager offerings to add to this cool thread. 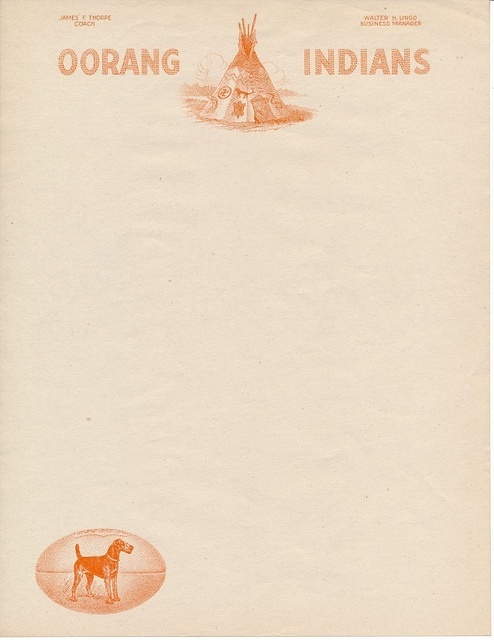 1941 SWC Schedule. Think of how many players that played those games fought for our country in the years to come. I've posted this before in my UT thread. In case yall aren't Longhorn fans here it is again.